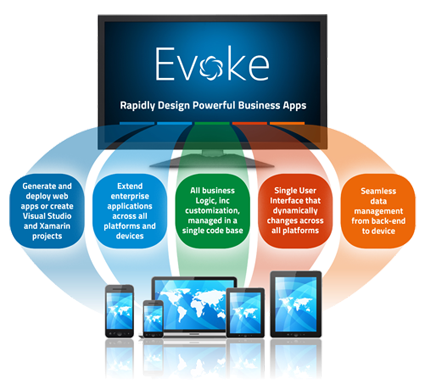 Evoke provides you with unlimited potential for your apps. You have the option to deploy as mobile web apps, hybrid or go fully native. Evoke will automatically generate your designed app into structured Visual Studio and Xamarin projects to provide a seamless path to native solutions. 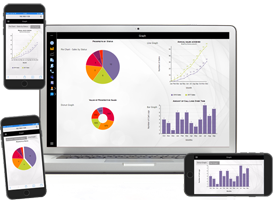 Evoke is a sophisticated visual development environment that allows rapid business app development by drag and drop, point and click and option selection. Rather than provide a closed development environment as traditional 4GLs typically do, it provides an open, extensible development framework, built on industry standard principles and tool sets, with unlimited flexibility to customise as required. 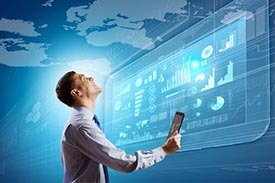 The framework is supported by an extensive range of actions, routines and multi-level selection processes that mean you can quickly build your user interfaces, define and manage your data, and employ Evoke functionality and business logic throughout to create your desktop, web and mobile apps. Evoke facilitates the creation of professional business apps by companies of all sizes and diverse requirements, from start-ups to the largest multi-nationals. Its advanced development platform is able to support the development of apps in no/low code environments, through to the automated generation of complete Visual Studio projects to be onward developed by large professional IT departments. No matter what size your company, Evoke provides a faster, more cost efficient and effective app development solution whilst ensuring you an unlimited growth path through its flexibility and open array of development options. With Evoke, there is no requirement to engage new staff to develop your new apps. You are able to employ your existing staff who know your company, your systems and your requirements better than anyone. Evokes powerful but intuitive designer technology will support and assist them through each step of the process of producing impressive and effective business apps.